Vedi Liquid Castile Soap is made from an ancient Spanish recipe of soft and natural soap reinvented by Vedi. 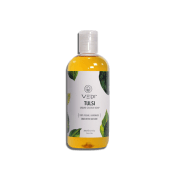 The Vedi Castile Soap has organic olive oil at its foundation along with a rich blend of organic castor, coconut and wild crafted hempseed oil. It's what makes this soap 100% vegan and natural. It's free from parabens, alcohol, detergents, and petroleum-based derivatives, making it a choice to swear by, not just for your skin but also for the planet. The liquid is made from certified organic ingredients and none remain after the saponification of oils into soap. Besides being eco-friendly, Vedi castile soaps are free from all chemicals and toxins. A licensed pharmacy from your nearest location will deliver Vedi Liquid Castile Soap Tulsi. Once the pharmacy accepts your order, the details of the pharmacy will be shared with you. Acceptance of your order is based on the validity of your prescription and the availability of this medicine.